Adoption is a serious consideration, one that requires planning. This is certainly not the case today. Be almost sheer accident, today I stumbled into Save The Words (Nancy White tweeted a ning site about visual poetry and I found the link there). The premise is that, language, as an evolving species, tends to lose words to lack of use. This site presents and amazing (Flash heavy, yes Hilary) site where you pan around a quilt of graphic representations of dying words. There is ambiant background voices, "save me!" "over here" that is both neat and creepy. When you click a word, it provides a definition, a pithy sometimes snarky example of it used in a sentence, and a form field where you can choose to adopt one. The adoption agreement is "I hereby promise to use this word in conversation and correspondence, as frequently as possible to the very best of my ability." After a lot of looking and browing (many of the words are rather bodily function oriented or also seeminly british in source??) I landed on vacacity, a noun meaning "emptiness"
Without the web and things like this, my life would be one of vast vacivity. 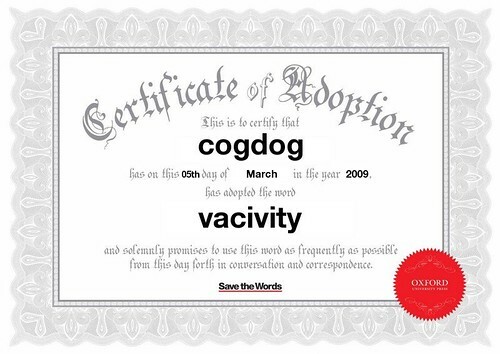 And having thus adopted a word, I received this stunning certificate, suitable for framing (or lining bird cages). But it is a lovely interface. It draws you in. It invited you to explore. It surprises you. It makes you laugh. It makes all those stiff text, hyperlink-less web pages the pinnacle of vacivity. All that beauty, and yet the certificate itself is borked, with two instances of the word ‘has.’ I emailed the site owners, and hope they fix it; not least because I am the proud owner of two of these certificates, but would prefer to display versions without grammatical incongruities. I would not wish to encourage volgivagant amusement at this most solemn and sacred duty we have undertaken. I’m glad I found this site through my student and sorry sorry sorry I missed it here. That’s a divided mind divided mind for sure for sure. Guess I was just way hungover from the cogdog’s visit to my humble adobe. OK, I’m deflecting; it was just my bad my bad. I adopted the word archiloquy but I didn’t get a certificate .. they offered me the opportunity to purchase a t-shirt with the word.